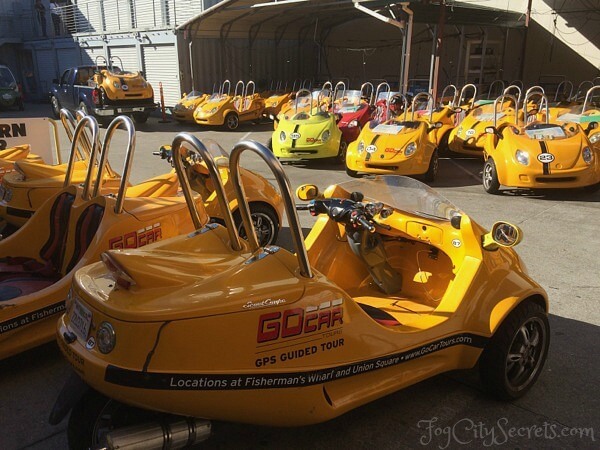 Go Cars in San Francisco: a super fun way to explore the city! 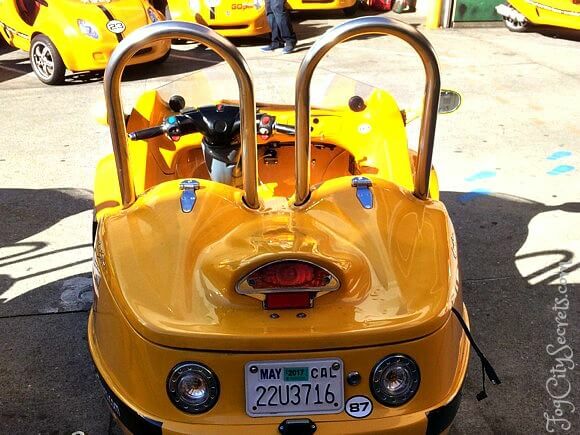 You may have seen those little yellow cars buzzing around the city. If you're feeling a bit adventurous, you can hop into a Go Car and explore San Francisco on your own...with a little help form your knowledgeable GPS guide. I had seen the Go Cars scooting around San Francisco for years and thought they looked like fun. We finally tried them out and had a blast! Here are my tips on the best way do Go Car rentals and how to handle these little guys in the city. All the things I wish I had known! The Go Car is really a glorified motorcycle with three wheels, that runs on gasoline and has motorcycle-type controls. The cars have a GPS navigation system connected to an audio tour program. When you get close to an attraction, the Voice tells you some interesting information about it. And of course, gives you directions as you drive. 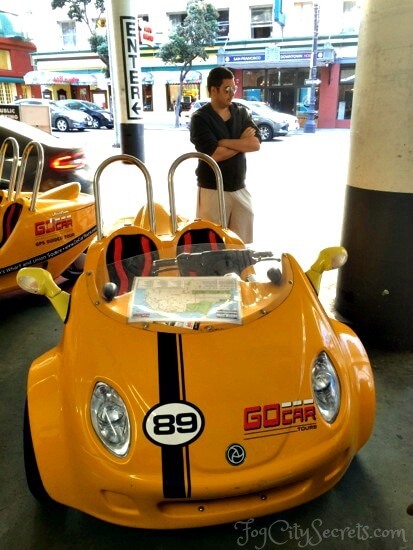 San Francisco has two offices for Go Car rentals, one near Union Square and the other at Fisherman's Wharf. GoCars has an extensive network of tour routes. They take you past just about all of the main San Francisco tourist attractions, plus some very pretty areas that you might not get out to on your own. The Fort Point spur takes you right down here. Great view! 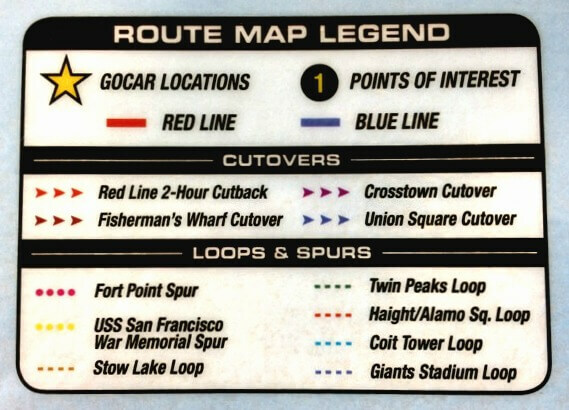 There are two main routes (blue and red on their map), with extra loops and spurs plotted off of those. The optional (well, everything is optional!) detours are announced as you approach a turn-off point for them. You also are given some bug-out choices here and there, so you can cut the tour short and head back to base if you feel like it. 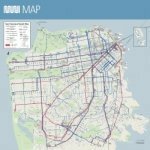 And of course, you can drive anywhere you want in San Francisco (with a few exceptions). What happens if you leave the route? Nothing happens. The Voice stops talking; time to look at the map. You can stay off the route as long as you like, or head back to it and continue the tour. Or zip over to catch a different route. The Big Picture: this map goes with you in the car. Here's the legend for the route map, including the additional loops and spurs. 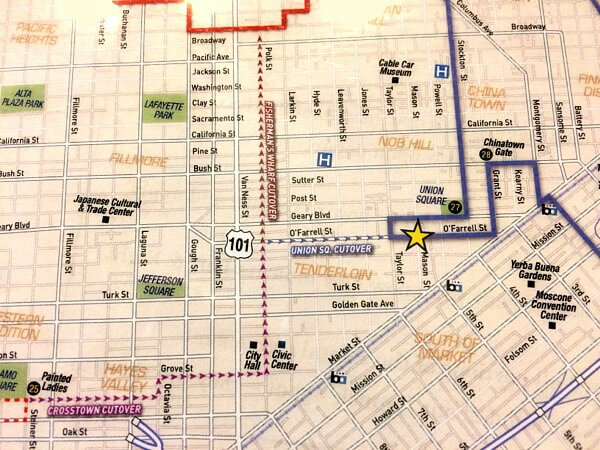 This route starts at the Union Square Office (321 O'Farrell Street). 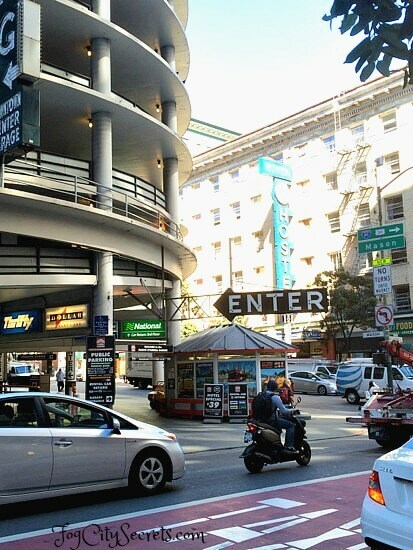 If you pick up your car at this office, you'll be jumping right into the downtown San Francisco traffic scene. They have you go around the block once to make sure all is well, then you head off into the heart of downtown SF: the Financial District, with its deep concrete canyons. Fun to drive through but a bit intimidating in a tiny car! Especially when you are just becoming acquainted with your Go Car. 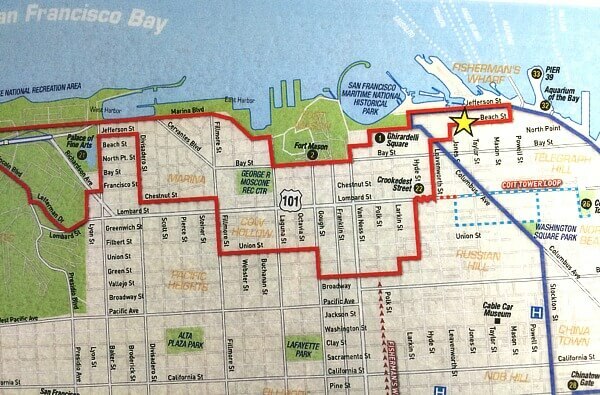 The red line route starts in Fisherman's Wharf (431 Beach Street). This office is in a much less congested area, traffic-wise. I think it's a lot less stressful to start here, especially for first-timers. The first few blocks of the tour you're getting used to the controls and how it handles. Best not to be in heavy, downtown traffic! 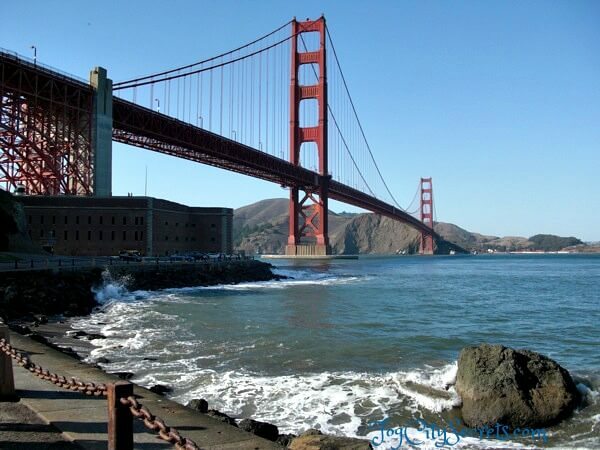 Take a look at the list of attractions below, and check out the routes on the maps, to see which SF sights you would most like to see on the tour. 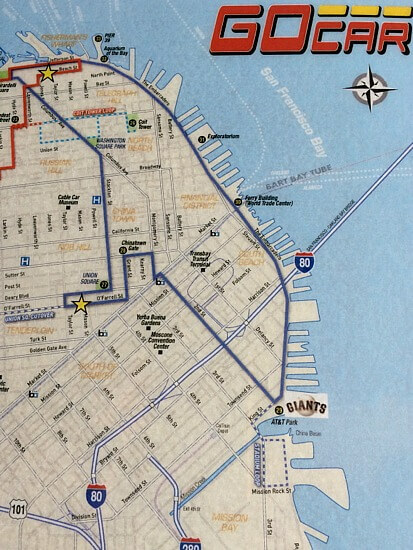 The Blue Route is shorter, and includes Chinatown and North Beach, plus the Embarcadero, which are all great to see, but doesn't include the western part of the city that many visitors miss. I think it's easier to drive the Red Route, traffic-wise. How to choose!? Actually, you don't really have to. You can mix and match, and plot your own route, knowing there's no audio off the planned routes. Time is a factor in choosing a route, as well. One hour isn't enough, even for the shorter route. Between two and three hours allows you to cover quite a bit of territory. But take more time, if you want to do some of the detours, and stop for exploring or eating. As long as no one is waiting for your car, you can take as long as you need and head back when you're done. They will just add on fees in 15 minute increments. Just check with them before you start to make sure no one has booked the car for later. Can You Return the Car to Either Office? Actually no, unless you arrange for that before you leave. Someone might be waiting for it. If you do return it to the other office, there's an extra fee. The following list are some of the "sights" that the tour routes go past and are described by the Invisible Guide; pretty much all of them, at least the well-known ones. First Part of the Red Tour (begins at the star). As you are traveling along a route, now and then the Guide will offer you a choice to add on an extra route. 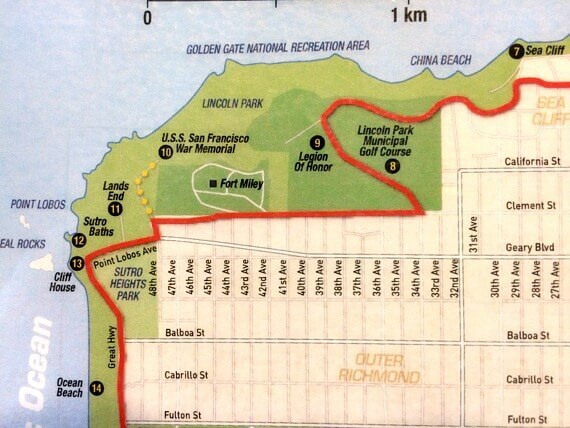 For example, on our way to the Embarcadero on the Blue Route, near ATT Park, the little voice in our ears suggested a detour to Mission Beach, a newer residential neighborhood near ball park where many of the tech workers in SF's current tech boom have found apartments or lofts. There are 8 extra excursions in the network, and they pop up here and there when you are near them. All of them are marked on the map. 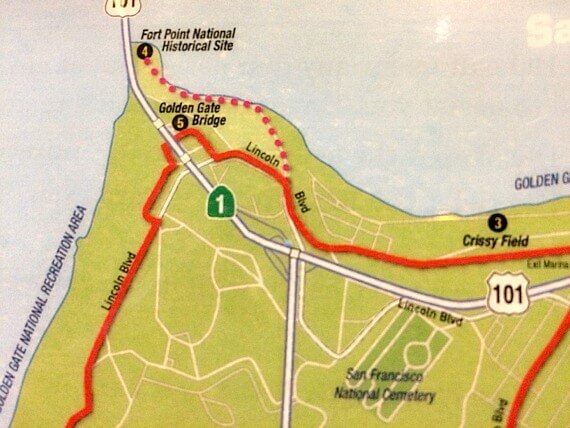 We accidentally took the short spur to Fort Point and the Golden Gate Bridge and we were glad we did. Stupendous view of the bridge! From the War Memorial Spur, you can walk down some steps and get some fantastic views of the bridge and entrance to SF Bay at Lands End. More on Lands End. Stow Lake is also very pretty, with waterfalls, paddle boats and a Chinese pavilion. More on Stow Lake. Twin Peaks has the best view in the city, and that's saying something in a city known for its many OMG views. It's a long detour, but worth it if you have the time. More on Twin Peaks. The Haight-Ashbury and Painted Ladies at Alamo Square detours are more good ones. This is a fun area, and not that far off the main route. You can also take short cuts between the routes, to cut it short or switch over to another route. Your audio guide is with you if you stay on the marked detours and crossovers. 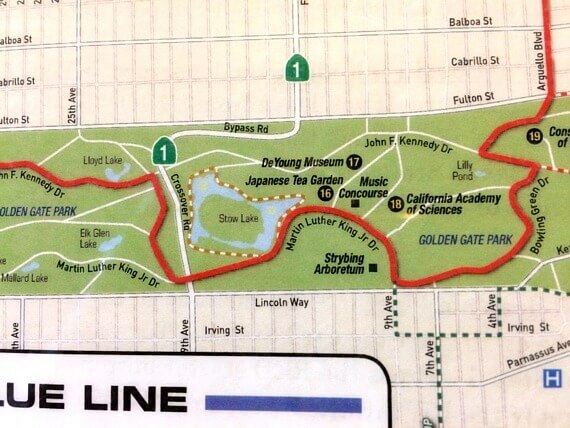 Here is the main cut over between the Red and Blue routes. 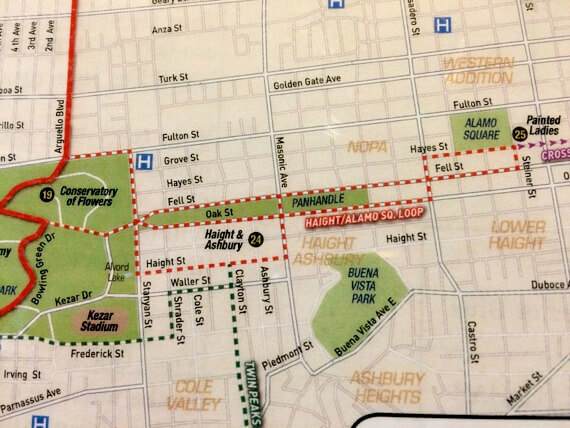 We weren't planning on doing the Haight/Ashbury detour, but again (due to conversation and loud engine noise), we accidentally left the park and went into the Haight. 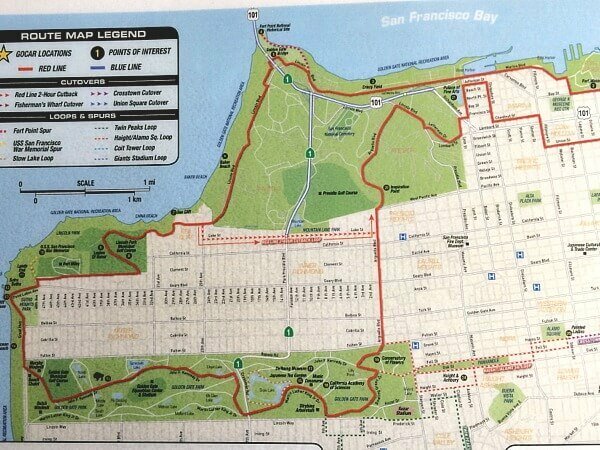 We decided to keep going after the Haight and Painted Ladies, and use the Crossover Route to join back up with the Red Route before Lombard Street. I have to say that this crossover isn't very scenic, other that going past the City Hall building, which is a beautiful sight with its enormous, gilded dome. The drive straight north on Polk Street goes along the edge of the Tenderloin District, through a less savory part of the city; fairly seedy and known for its crime and underage male prostitutes...sorry! It gets a lot better after a few blocks, and it's safe enough during the daytime. Just so you know. The Blue Tour Route (starts at the star). Avoid the rush hour (go before 2 pm). 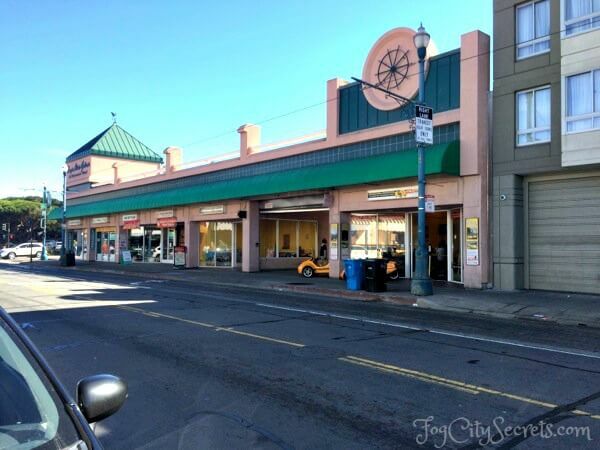 Use the Fisherman's Wharf Office (less traffic). Travel light (medium backpacks won't fit in the trunk). GPS guidance goes mum if you go off the route. And most important...avoid the rush hour! Now that I've been on the Go Cars a couple of times, I know what not to do! Here are some things I wished I had known before I went. Who should go on the Go Car tours? It is very likely that at some point during the tour, you will need to back up. So the question becomes, is there someone in the car who can get out and push, while someone else steers? It's not that hard to push them, but it does take a certain amount of strength and agility. Any reasonably fit, or even not-so-fit, adult could do it. And probably a ten-year-old child. Someone with back problems? I wouldn't recommend it (but they could still drive). I have often seen parents driving two Go Cars, each with a young child as a passenger. I don't know how well that would work out if they need to turn around and back them up. But lots of folks do it, so apparently they manage. The first time I drove one, my hands got really tired, but eventually I realized I didn't need to grip the brakes that hard. On my second trip, I didn't have any problems. How old do you have to be? Drivers must be at least 21 and passengers at least 4 years old. If you are from outside the U.S., you just need your own local license; no international license is required. You can purchase extra liability and collision damage insurance from Go Cars if you want to. Dress warmly. San Francisco is a cool and foggy place much of the year. But we do have some nice warm months, too. In a nutshell, my advice is bring a jacket, and dress in layers, so you can adjust to changes in temperature. Both times we went it was beautiful and sunny, with temps in the mid 60's, but we were glad we had our warm jackets. The cars are open, and even on a warm day, zipping along it can get pretty cool. If it gets hot, you can always take off a layer. Sunglasses are a good idea, too. You'll be wearing a helmet, so you won't need a hat. Sunblock. My nose was bright red after one of my trips. Helmets are required and provided. They have Lysol at the office to spray them with, ha ha. Best not to think too much about that. 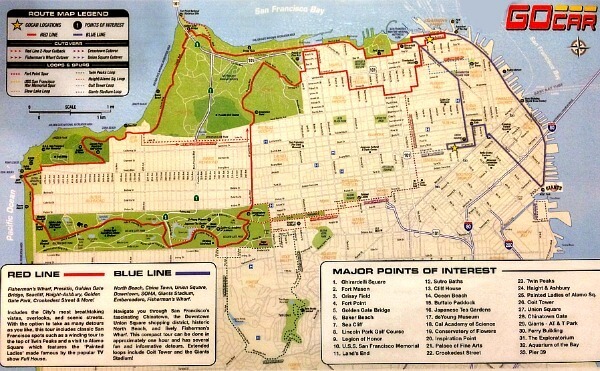 They provide you with a big, laminated map of the city with the routes marked, so you're all set there. There are instructions on the back with GoCars' contact info. Bring a cell phone in case you need to call for assistance; some people have reported breaking down and needing a replacement car, which they will bring out you. Travel lightly. There is very little storage space in the cars, so plan accordingly. It's a snug fit with two adults in the car and the "trunk" in back is quite small; it could fit two medium-sized purses, but not a backpack. There is a little space at your feet, but not very much. The Trunk: two small spaces inside around that taillight apparatus. 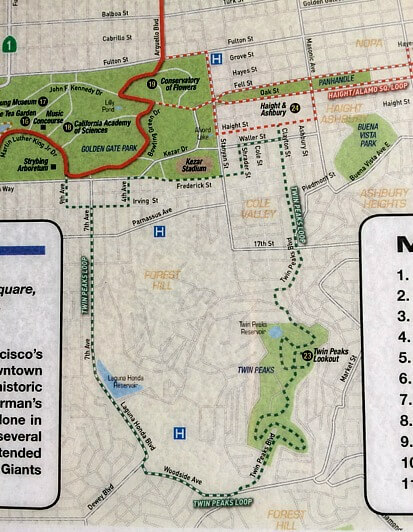 There are warnings on the back of the map about going up San Francisco's hills; we can't say we didn't know. It happened that we had a particularly noisy engine on our second Go Car trip. We were leaving Fisherman's Wharf, passing the cable car turn around on Hyde Street, when I couldn't hear what our Invisible Guide was telling me. I kept going straight, up Hyde. Disaster! Well, almost; it was certainly embarrassing. Right away the car started slowing down; full throttle had no effect. We came to a complete stop about a third of the way up the block. 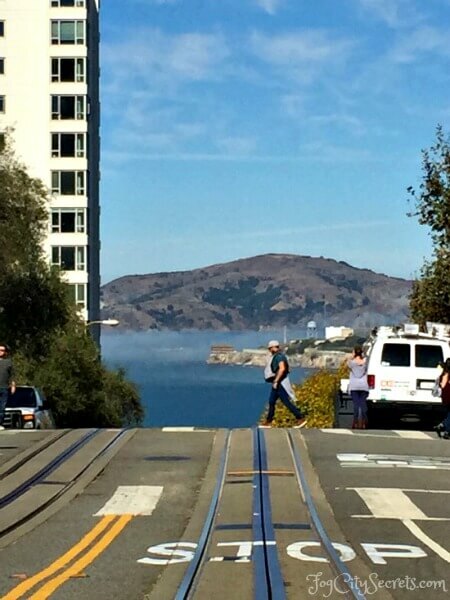 In order to turn around, my unhappy passenger had to get out and push me across the street (apologies to the cable car driver). Then, because these things don't back up and we had no power anyway, I had to be pushed uphill to execute a 3-point turn to get going downhill again. Regular Go Car, or the souped-up, more powerful version? My first trip was on the regular Go Car, but that was the Blue Route and it's not hilly. Before the second trip, I read advice on Yelp that the more powerful engines were much better on the hills, so I booked the Ferrari. I can't compare the two re:power on hills since I didn't test the first one that way, but the second one didn't feel that different, other than having a much noisier engine. But who knows if the noise was related to the horsepower difference. I can tell you the more powerful engine does not go up steep hills! The higher HP one is $20 extra. Rush Hour...Don't Even Think of It! Our first trip got off to a late start, and even though I know better, we headed out into rush hour traffic around 3:00 p.m., right into the pack of commuters leaving their downtown offices (the Blue Route). Our first 20 minutes was gridlock in the Financial District, while trying to figure out all the controls on the Go Car! We did eventually make it to the Ferry Building and the Embarcadero, which were great and not difficult to drive, but we used up so much time in the beginning, we had to cut our trip short and didn't make it to Chinatown or North Beach. Leaving from the Fisherman's Wharf office (Red Route) would have been a lot easier that time of day, and the park traffic would have been OK, but I still would try to avoid anything after about 2:30 p.m. 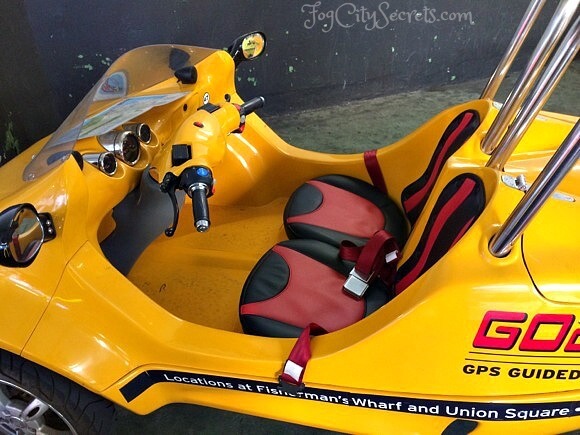 Your very own, 3-wheeled motorcycle! The driving mechanism is very similar to that of a motorcycle, but for those of you who don't ride them, never fear. It's really pretty simple to learn. After your first five blocks or so, it becomes almost routine. It's just that first block after you dive into the San Francisco traffic that's a bit tense! Before you get into your Go Car, the staff goes over how everything works, but after we started driving, we were like, so what does that red button do? There are no foot pedals. The accelerator is the throttle on the right handlebar. Stopping or slowing: grip one or both of the hand brakes (and let the throttle roll back to neutral). It has automatic transmission...yay! No shifting necessary. Backing up: it doesn't have a reverse gear! If you need to back up, your passenger gets out and pushes. When would you need to back up? Making a U-turn and not quite getting around (we did that more than once). Getting out of a parking space. Turing around in a tight space. These little Go Cars have a surprisingly large turning radius! My passenger had to get out 5 times to help me turn around on u-turns (getting grumpier each time). Tips on the brakes. Like a motorcycle, there are front and rear wheel brakes. Both are hand brakes, like a bicycle's. Either one can stop the car, but using both stops it faster. I gripped both brakes tightly for the first 20 minutes until my hands got tired. From then on, I mainly used the left brake and used my right hand for the throttle. When my left hand got tired on the brake, I just used the right brake for awhile. Tour narration volume: the audio volume is a knob below the dashboard, in the center of the car. San Francisco isn't the only city that has Go Cars. You can also rent them in San Diego, Barcelona, Madrid and Lisbon. The Go Cars are charged by the hour, starting at one hour for $64.16. As the time period rises, the hourly rate drops. GoCars books them as one-hour tours, two-hour tours, three-hour tours, etc, but really you can take the car for any period of time, and go anywhere in the city (almost anywhere: not over a bridge or on the freeway). You book the tour for a certain time period, but if you take it for longer, you just pay for the extra time by the hourly rate, in 15 minute chunks. Just make sure before you start out that no one else has booked it for later. They are very flexible. The prices below include the added city fees. The all-day tour for $244.69 is a good bargain when looked at hourly. In spite of a few mishaps, all of them my fault, I had a great time. It was so much fun zooming around San Francisco, passing such amazing scenery! And The Narrator added many interesting bits of information about all the sights to spice it up even more. My favorite part? 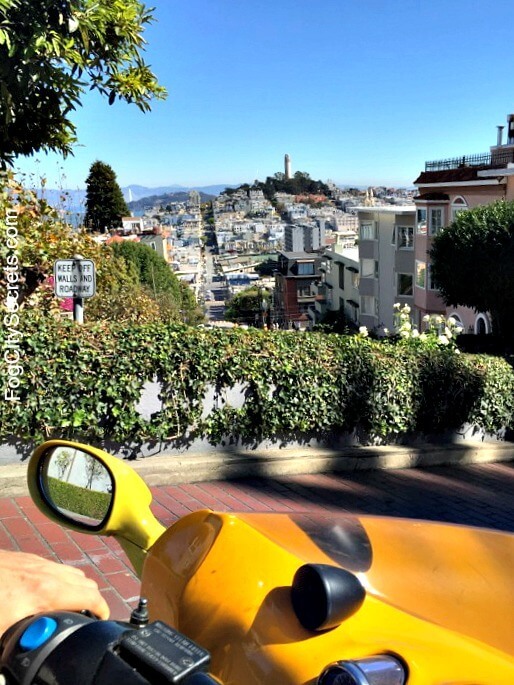 Driving down the twisty curves of Lombard Street! 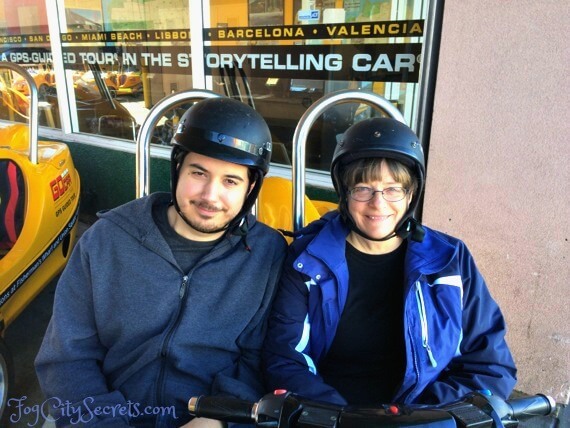 You'll find yourself the object of many appreciative smiles, and I'm sure we are now starring on a few travel blogs, given the number of photographs taken of us in our Go Car! I highly recommend it. Tip: check to see if Goldstar.com has half-price tickets. They come and go, so check with them first. It's free to sign up. Go to Goldstar.com. 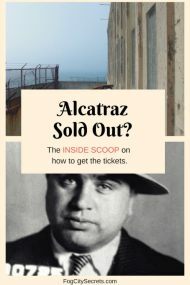 If Goldstar doesn't have tickets, you can check car availability and book the tour here. You save $2 by booking it online.